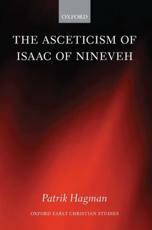 What is striking about this monograph is how well Hagman narrates an anthropological investigation into the nature of asceticism with Isaac of Nineveh, the ascetic’s ascetic, as the exemplar. Well-written, yet methodical and thorough, Hagman has provided an essential starting-point for further studies of Isaac of Nineveh. Since scholars seem to keep finding new works of Isaac, this starting-point should prove to be useful to a new generation of Isaac’s readers. Det här inlägget postades i work. Bokmärk permalänken.